THE view of Royal Bafokeng Platinum (RBPlat) CEO, Steve Phiri, is that primary platinum supply from South Africa will continue to decline – by about 195,000 ounces this year or nearly 3% of the total – whilst demand for the metal will increase, but only marginally. This is pretty much the consensus throughout the industry which has seen fabulous increases in demand for platinum’s sister metals – rhodium and palladium – but little in the way of an improvement for platinum which they mine the most. Whilst 2017 has been a dispiriting year for platinum, the general expectation is that blue skies are just around the corner. And yet things keep happening to upset the applecart. One is a recent court decision in Germany giving its metropolitan authorities the discretionary power to ban diesel-powered cars from their streets – a development that, were it taken up, would have a significant impact on platinum demand which is used extensively in diesel autocatalysis. In fact, an estimated 12 million cars complying with an so-called ‘Euro 5’ and earlier emission standards for noxious fumes could be affected. 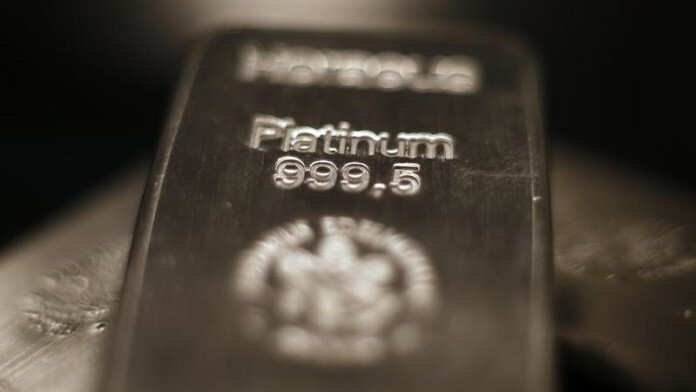 “The demand and price for platinum, the main autocatalyst metal in diesel vehicles, is expected to take a hard hit, while palladium, used in petrol cars, gains in value and volumes,” said Ayanda Makupula, chief processing and PGM markets analyst at Afriforesight Commodities. So a potential headwind to the much-vaunted recovery for platinum demand. Another recent market jolt has raised its head on the supply side. According to Johann Steyn, an analyst at Citi, there’s the prospect that a planned joint venture between Noril’sk Nickel and Russian Platinum could bring massive amounts of new production onto the market, possibly by 2023. Prior to the risk of Russian production coming on steam, the expectation among South African platinum producers was that with the trend towards lower supply, a sizeable deficit would emerge and lift the price. “The development of the Russian Platinum joint venture could be plug this longer term supply/demand gap and weigh on longer term price estimates,” said Steyn in a note. “South African producers could thus find themselves in a longer term environment of low prices, low supply, and higher costs,” he said. Higher costs are likely because as South African supply falls, its fixed costs increase. Naturally, South African producers don’t quite see it that way, including Northam Platinum which, in 2016, set out plans for a R7bn expansion plan on the basis that a considerable supply deficit would eventually emerge in the platinum sector. Paul Finney, group executive for refining and marketing at Impala Platinum, said he didn’t believe the Noril’sk/Russian Platinum Joint Venture was a serious risk for now. He also thought that flooding the market with palladium – some 2.5 million ounces of the metal is being planned by the joint venture according to some estimates – would most probably replace recycling of palladium which was elastic supply. Similarly, with the potential diesel car ban in Germany which doesn’t hand the cities carte blanche. “We’re still unpacking the German court judgement but the first thing you have to understand is that cities have the right to ban provided they apply proportionality,” he said. So not all Euro 5 cars, which are a later emission standard and have higher loadings of platinum, would be affected. Finney also thinks car manufacturers will shift production towards petroleum-powered cars which are more acceptable in terms of emissions. Should that happen, the current deficit in palladium would only widen. “The wholesale bans of diesel is not sensible if Euro 6 engines are considerably cleaner than Euro 3, 4 or 5,” said Van Schalkwyk. “A lot of work needs to be done to convince the market that the new diesel engines are the cleanest they have ever been with legislation getting tighter. It is possible to produce a clean diesel engine if the correct amount of PGMs are used in the application,” he said. “In addition, even if these diesel vehicles are taken out of the market, they are likely to be replaced with additional vehicles which will all be subject to Euro 6 legislation in any event,” said Van Schalkwyk.